1. Remove the transparent protective film from the acrylic plate. 2. Place acrylic plate in base. 3. Plug in USB cable to power supply/computer or insert batteries. 4. Press the power button to turn on. 5. Press the power button to change color.The lamp will change color each time you press the button. 6. There are 7 colors(Red,Green,Blue,Yellow,Cyan,Purple and White)plus an alternating option. 7. Hold switch down for 2 seconds to turn lamp off. 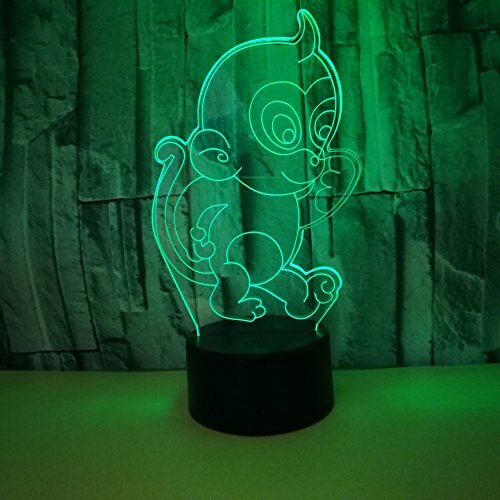 Note: It is suitable for bedroom, child room, living room, bar, shop, cafe, restaurant etc as decorative light.It's also an cost-effective gift for kids. 3D light hologram--The 3D optical illusion lamp uses a 2D flat construction that transforms into an illuminated 3D object,create a 3D effect. Durable & Energy Saving--Power spend:0.012kw.h/24 hours.LED life span:10000hours. Smart touch control colors--7colors can be changed flexible to red, green, blue, yellow, cyan, purple, white. If you have any questions about this product by Annie Bridal, contact us by completing and submitting the form below. If you are looking for a specif part number, please include it with your message.